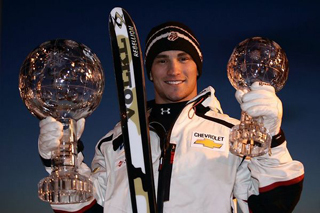 According to a story by the Denver Post, American moguls skier and former professional football player Jeremy Bloom (27) has decided to retire from freestyle skiing after a recent attempt to rejoin the U.S. Ski Team for a chance at his third Olympic team in Vancouver. The Loveland, Colo. native will leave the sport to focus on his Wish of a Lifetime Foundation for low-income elderly. After joining the U.S. Ski Team at age 15, Bloom began competing on the Freestyle World Cup in 2000 at the age of 18 and went on to win 10 World Cup competitions, a World Championship title in 2003, a World Cup moguls title in 2002 and an overall World Cup title in 2005. He also had top-ten finishes in both the Salt Lake City and Torino Winter Olympics. Bloom’s football career took him from being a kick returner at the University of Colorado to time with the Philadelphia Eagles and Pittsburgh Steelers.